VILNIUS, Lithuania (CNN) - Secretary of State John Kerry for the past month had been planning a quick European trip focused on the Mideast peace process, undeniably his top foreign policy priority since taking office in February. In addition to briefing Arab ministers on the status of the recently restarted negotiations between Israelis and Palestinians, America's top diplomat had to urge European Union foreign ministers to drop sanctions they imposed this summer against Israel for its continued settlement building in the West Bank. But with the United States inching closer to possible military action against Syria over alleged chemical weapons use, Kerry has a much more urgent diplomatic mission - to implore skeptical allies to join an international coalition to punish the regime of Bashar al-Assad. Senior State Department officials traveling with Kerry said in discussions with his European counterparts in Vilnius and Arab League ministers in Paris, Kerry will explain U.S. plans for military action and coordinate efforts to resolve the Syrian civil war through a political process. "We will certainly want to talk to them about how we see the situation developing in the coming days, and we will also want to talk to them about where they can be helpful, especially in terms of building a broader international consensus," one senior State Department official said. "All of our states are members of the international community that long ago established the use of weapons like this is outside the norm of international behavior," the official added. So far, his efforts to build a coalition have been mixed at best. France and Turkey are the only two countries publicly committed to take part in any military action. Fewer than 10 nations overall have expressly voiced support for military intervention. Many European countries are opposed to any military action without a U.N. mandate, which the United States has ruled out over what it calls Russian "intransigence" in the Security Council. "I don't think there is any question in any of the European Union members about the need for an international response," the official said. "The question that has been posed is what is the sequencing and how does it relate back to the United Nations. And I think there needs to be a discussion about what is possible with the United Nations and, if the United Nations' avenue is blocked, what does the international community need to do." The official said he did not expect Kerry to go into the details about particular roles countries could play as part of any military action, but instead would work to "coordinate a political response." President Barack Obama has stressed he is considering a limited and targeted mission to respond to the use of chemical weapons and deter the al-Assad regime from using them again, a point stressed in more than eight hours of testimony on Capitol Hill this week by Kerry, Secretary of Defense Hagel and Martin Dempsey, chairman of the Joint Chiefs of Staff. Sens. John McCain and Lindsey Graham have criticized the Obama administration for an incoherent Syria policy and have pushed for stronger military action to cripple al-Assad's forces fighting rebels in a two-year civil war. Obama has said he has no plans to wade further into the Syrian conflict and so to avoid the appearance of "mission creep," the administration has been loath to publicly link the military action under consideration to efforts to help the opposition. 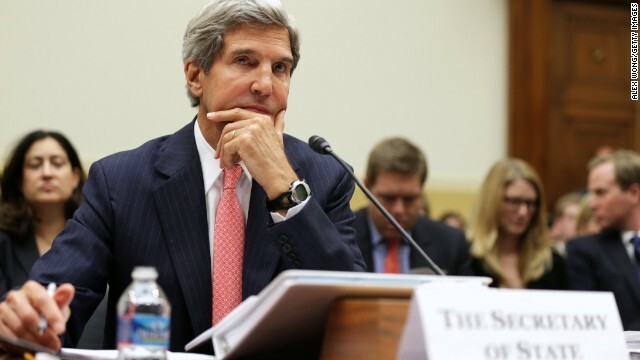 Kerry, however, has spoken of a potential "downstream" benefit of weakening al-Assad's forces against the rebels. The official said he didn't expect a "huge change" on the ground the day after strikes end, but felt that after a brief respite from additional Hezbollah and Iranian fighters, the regime would continue to lose ground. "I think the war of attrition will grind on ... without the use of chemical weapons," the official said. "It is a war of attrition that the regime is slowly, gradually is losing." The official noted that al-Assad's forces used chemical weapons in neighborhoods they have been unable to retake from rebels for several months. "He couldn't take them any other way," this official said. "If you deter his use of chemical weapons you are, in effect, weakening him on the battlefield." While it has seen some improvement in recent months, the United States has been frustrated with the lack of progress by the political opposition. Officials said they are encouraging the opposition to formulate a negotiating team for eventual talks and establish stronger municipal government in areas of Syria where government control has receded. The United States has provided some assistance to maintain rule of law, including funding for police in areas like Aleppo. The Syrian opposition has called for a much broader air campaign, including a "no-fly" zone and has criticized the United States for failing to provide weapons Obama promised in June in response to what he said was the first breach of his "red line" on chemical weapons. While the military action under consideration is "to deter the use of chemical weapons," the official noted, "there are other programs and other efforts under way to change the balance on the ground that are not connected to this particular issue of use of chemical weapons." The United States has already begun to train select opposition units. Hagel this week on Capitol Hill referred to a "covert" program to aid the rebels. The senior State Department official noted "the Syrian armed opposition is getting a variety of weapons from a variety of countries" for many months. "They are hopeful that we are going to take steps to deter the regime from using chemical weapons. They have complained for many months that we have not taken military action," the official said. He added the United States has had "fairly intense" discussions with opposition leaders about what military action was under consideration. "We have been very explicit to the Syrian opposition that any military action we might make in response to the chemic weapons attack is going to be limited and very focused on establishing the deterrence. Do they all welcome that? No. Some would like us to do more than that, and they will be disappointed, therefore." But inaction, the official said, would leave the opposition "extremely disappointed" and "more fearful than ever that the regime will use chemical weapons." He predicted larger refugee flows out of Syria as a result which could further destabilize neighboring Lebanon, Iraq and Jordan. "They will look at the United States and other members of the international community as less reliable and there probably will therefore be that the moderates within the oppositions will feel somewhat weaker and will boost the prospects of groups on the more extreme edges," the official said, adding that such a scenario on the ground cold hurt chances for a political solution. Even as he led calls within the administration for tougher action against Syria, Kerry has sought to work with Russian Foreign Minister Sergei Lavrov on bringing the warring parties in Syria together for negotiations on a political transition. The senior official Kerry would be discussing those efforts during his talks this weekend, although no date has been set yet and the parties have "some distance to go" before the talks could be held. The United States hopes military action, however limited, could change al-Assad's calculus and encourage him to negotiate. Although Syria is sure to top the agenda during Kerry's meetings, aides say he will still stress the importance of nurturing the fledgling peace process. After five months of shuttle diplomacy between Israelis and Palestinians, Kerry in July announced a resumption of direct talks between the two sides and tapped former U.S. Ambassador to Israel Martin Indyk as his Mideast peace envoy. The parties have committed to try and reach a peace deal within nine months, although privately both sides have voiced skepticism that was possible. While in London, Kerry will also meet with Palestinian President Mahmoud Abbas. Another senior State Department official traveling with Kerry said although the crises in both Syria and Egypt have distracted both the Israelis and Palestinians, they have also yielded important benefits. Kerry is also expected to lobby EU foreign ministers to reconsider sanctions imposed this summer against Israel, which banned funding of some projects in the occupied West Bank over European opposition to continued settlement building there. Is there anyone who thinks Kerry has a brain? Laughing stock of the world. Terrible Choice for Secretary of State- disgrace. Malcontent left wing, Obama boot kisser. Indeed a total disgrace and that evil face ! 90% OF USA CITIZENS SAY TO OBAMA "STAY OUT OF SYRIA PERIOD". Since the Israelies control Palistine Israelies do not need to question themself as to why or why not israelies use WMD on their Citizens. Israelies in America do the exact same thing to real Americans...remember Palistine is an Psraelie getto where by the Jews mandate is marshal law used on people who cannot defend themselfs e.g. non-jews living in the israel getto called Palistine. Ever since, Israel really not serious of any peace talk with Palestine. This could be proven right when massive building (settlement) is being undertaken while negotiation is in process. Think of this people (Israelees) are doing! They should stop all these things if they are interested for PEACE to build trust and respect. Kind of like the Palestinian's claiming they want peace, going to talks/negotiation, and fireing rockets before it even gets dark that same day? I assume that the Palestinians also need to stop building their settlements if they are interested for PEACE to build trust and respect... Right? Maybe Assad should purchase Israel's inventory of white phosphorous bombs! Israel "got away" with using them, why not Assad? Just as cruel as gas! Did we bomb Israel for using illegal weapons??? Ha, ha, ha!!! Israel can do no wrong in the eyes of "our" government! Maybe Israel can swap gas for phosphorous bombs! If Israel used gas, "we" would come up with all manners of excuses to allow it! Get Congress to vote on it!!! 90% in favor of Israel!!! Israel never used illegal weapons. soon a there will be dead bodys of small jewish children in israel there will be blood from there a s s e s soon all of them will get nuked. Are you one of those Israel is supposed to make peace with, Saeed? Quite true john, quite true. Only a stupid, crazy fool would disagree with that!!! Only a retard would agree with it.